from someone who was actually there! In the mid 90’s we launched our first website. The stories and interviews that we published there were an instant success in an information hungry world eager to make use of the new technology known as “the information super highway”. With the making of A PHANTOM MENACE in 1997 our popularity soared to half a million hits a week and I started to write unknown facts about the building of Yoda for ESB. The article below is from that site with a few additional notes. This is the only technical information on the building of Yoda ever released. To get a full understanding of the background to the design of the Yoda puppets you would do well to read some of the earlier postings on this blog about the background to STAR WARS creature designs before reading this. Ergo: "Why did you break the info on Yoda into three parts?" Nick: "There's just too much to tell. You see......there was more than one Yoda. " Nick: "There were four versions built EMPIRE STRIKES BACK alone and more were produced for RETURN OF THE JEDI. Take a look at the two movies again. It's pretty obvious that different puppets were used on each of them. Into the bargain, the main Yoda puppets were made up of interchangeable parts. A head and neck (actually two). A torso. And an assortment of arms and legs to suit different situations. " Ergo: "I had no idea." Nick: "There were a lot of people involved in building those different versions. So I'm breaking this discussion into three parts to help the reader differentiate between the different versions and to give credit to all concerned." Ergo: "OK, so..... the big question..... Who created Yoda? Nick: "There are a lot of cruise ships that visit me regularly in the Caribbean. The Port Lecturers love to tell everyone that I created Yoda, but I didn’t "
Nick: "The two most important players, (excluding George Lucas), in creating the world's most popular alien , (sorry E.T.) were Stuart Freeborn who headed the Make-up/Creature Effects Department and Frank Oz, who did an incredible job of bringing the puppet to life. Niether Frank or Jim Henson were directly involved in developing Yoda on a day to day basis. But without Frank’s supervision of the puppeteers Yoda would not be as much loved as he is. Stuart was the one who (with George Lucas), made all the key decisions. He's the one who had to take all the heat.... the pressure of being responsible for meeting the deadlines. Although we thought we had a lot of time to get Yoda built, those deadlines came looming all too quickly and the pressure was extreme. Of course, Stu didn't physically do everything himself, nobody could...... that's where the rest of us came in. I like to think of myself as a key contributer but Stuart was the one that gave me and the other guys the opportunity to contribute by telling Lucasfilm to employ us and then trusting us with various responsibilities." Ergo: "So did the make-up department do the whole thing...... the building Yoda? Nick: "With the exception of the radio controlled Yodas that I will talk about in The making of Yoda Part 2, I would say, basically, yes. Yoda was constructed entirely in our department. However, it has to be said that Stuart brought into the department people like Wendy Midener (who was a regular at the Muppets), Bob Keen (a trainee with a background in model making), and David Barkley (another trainee with a background in puppetry). Besides Stu and Kay there was only Graham Freeborn and myself with a background as effects make-up artists. We were right at the birth of movie animatronics. Things were changing very fast. I think EMPIRE STRIKES BACK was the first "in studio" movie in Britain to assemble a creature workshop that incorporated a strange meld of assorted talents from various backgrounds. A lot of movies did it after that, but EMPIRE was the first. 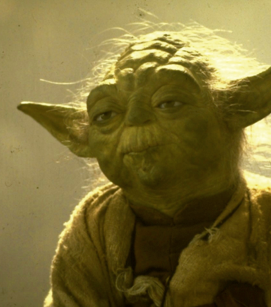 "Wendy Midener played a key role in constructing Yoda. She was also one of three operators who assisted Frank. Ergo: "Was Oz hard to work with?" Nick: "Frank was great. Talented, knowledgeable, appreciative..... a real professional." Ergo: "When did you first meet him?" Nick: "When he came to have his arm cast. The television studio where the Muppets was shot was in the same small town as our studio...... Borham Wood, (sometimes referred to as Elstree). So Frank didn't have far to come. I assisted with the lifecasting and when we had finished we looked at the cast of Frank's arm and someone pointed and said, "Look.... it's Yoda naked!" Ergo: "Did Lucas give a particular directive that defined what Yoda should be?" Nick: "Well of course there were Ralph McQuarrie's drawings which I discussed in the an earlier post. But the defining element that controlled Yoda's proportions and untimately altered his character, were the length and breadth of Frank Oz's arm." NOTE: An illistrator can draw anything. They are not limited by anything exept their pencil and paper. But a creature designer is limited to how that creature is going to work. In the late 70’s, with only 64k computers, we were forced to work to the PHYSICAL limitations of the operator. So the Wampa was built around the proportions of Des Webb inside,.. the Tauntaun’s belly had to be big enough to house a midgit operating the animatronic head... and Yoda had to be modeled to the proportions of Frank Oz’s arm. Ergo: "Who did the modeling?" Nick: "Stuart did almost all of it. He started with a lump of clay mounted on top of the plaster model of Frank's arm and tried to recreate the drawing that Ralph had done squashed down to the new proportions. Wendy Midener did some work on the ears and modeled the hands and feet." "Of course, squashing the original design down into a 27" puppet changed the character dramatically. Yoda spent several months of sitting on a table in Stuart's room going through a number of metamorphoses. I don't ever remember a character that was so long in the modeling stage. George Lucas would come in and look at him and he would talk to Stuart....... and Gary Kurtz would come in and the discussions would start anew. They'd scratch their heads and think about it and after the conversation Stuart would sit down again and work away for another week before the whole process started again. The schedule was already set so the longer it took to model, the less time there was to actually build the puppet. I think the procedure and the delays were quite stressful for Stuart. He was pretty testy at times. We all did our best to stay out of his way so as not disturb him. I remember that at one time he had 3 or 4 different versions lined up on a table. Ergo: "Didn't I hear something about Yoda and Einstein?" Nick: "You might have done. A picture of Einstein ended up on the wall behind the Yoda sculptures and the wrinkles around Einstein's eyes somehow got worked into the Yoda design. So did Einsteins wight hair. Over the course of this evolutionary process Yoda slowly changed from a comparatively spritely, tall, skinny, grasshopper kind of character into the old wise spirited gnome that we all know today. The final step in that transformation was Franks insistence that the puppet should have no jaw fitted. That allowed him more freedom for expression as a puppeteer but it also meant that the skin hung loosely below the cheeks and that gave Yoda an older, rather chinless look that is quite different to the drawings Ralph did." Ergo: "So what did you do?" Nick: "While this was going on I was working on the Wampa and the Mynock and helping to complete the Tauntauns. When the Yoda modeling was declared to be complete, I had the nerve wracking task of cutting off Yoda's ears and preparinging the molds. When I say "nerve wracking" I mean it was really "nerve wracking". After watching Stuart spend months doing delicate, detailed work I had to mold the figure in Crystocal Gypsum (the British equivalent of Ultracal), a process that completely destroyed the model. There was no maquette.... if we messed up, all that work was down the drain. Stu was pretty nervous about it and couldn't resist double checking everything as the face was molded. NOTE: The following gets very technical. It’s meant for extreme fans who want to build their own Yoda. But if tech details bore you, skip the text on the blue background. The model was dissected into several different molds to make the various parts, as were needed to convert the clay sculpture into a working puppet. First was a three part skin mold. 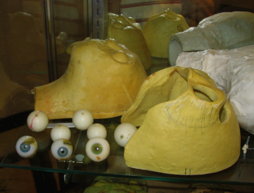 That was used to create a foam latex skin which was to be animated, partly by Frank and partly by the eye mechanism. The skin varied from 1/8 of an inch in thickness (around the eyes) to about a 1/3 of an inch elsewhere. A second mold was made from the plunger of the skin mold and the cast of Frank Oz's arm. This mold was used to create the skull which was made of fiber glass and rigid polyurethane. Obviously the skull had to be the difference between the shape of the inside of the skin and the outside of Franks hand and it had to be a perfect fit to both. Other molds were made of the ears, hands and feet. The accuracy of all these molds was critical if we wanted to put the parts back together again. Nick: "Visualing the concept of how this would be realized was probably more complicated than the execution. Preparing a model for molding requires the rather abstract creation of clay walls that define the negative space that will become the mold. If the walls go in the wrong place the parts can lock together later. 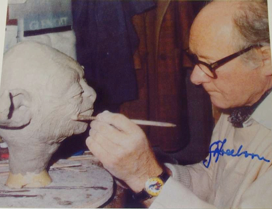 Stuart carefully double checked the way I had prepared the Yoda model for molding before he would let me proceed. He had a way of looking at you that made it clear that nothing short of perfection was acceptable but he and I had worked together on and off for seven years..... I enjoyed the trust he placed in me. Ergo: "You had a special relationship." Nick: "Stuart was my mentor for more years than I care to remember. Although he was a tough taskmaster I have to give him the credit for providing me with the breaks that allowed me to gain the experience and training that I needed to develop my own creative intellect." 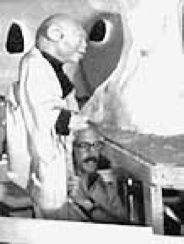 "Anyway.... once the molds were finished I set about producing the foam latex skins while our plasterers were making the skulls. I did almost all the foam latex work on the smaller creatures. We made skins of varying densities to find the right balance between resilience and resistance. The foam of that day would shrink (8%) and that was enough to stop them fitting the skulls properly. So another part of my job was to expand the shrunken foam back to it's original size using Di-iso-octyl pthalate suspended in alcohol." The parts that these molds produced were then used to fabricate heads and hands for different versions of Yoda that we needed to produce. 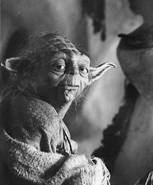 The first version was the Prototype puppet Yoda that Frank Oz operated in Yoda’s hut. I had little more to do with that particular version. Wendy Midener fabricated the torso for the puppet from 1" sheet foam.... that's flexible polyurethane, which she cut and glued in a manner that was commonly used by the Muppets at that time. The way the foam was bent and fixed together very effectively created the body shape whilst keeping weight to a minimum. Although there was no structure inside, it proved to be very durable. " Ergo: "What about the arms and legs?" Nick: "Wendy made those too. They were detachable and there were several different versions. Some were operated on rods and others were worn like gloves, directly on the operators hands. The nature of the shot dictated what they would use. Frank and Wendy brought with them a wealth of puppeteering experience. Frank was Jim Henson's closest associate and had worked in television through SESAME STREET and THE MUPPET SHOW for many years. Wendy was very used to working with him and had built famed Muppet characters like Miss Piggy." The first Yoda head was assembled by Stuart. Helping him was a 21 year old trainee, Nick Dudman, who 20 years later would build the creatures for A PHANTOM MENACE. Stu adopted Nick as his personal assistant and Nick spent most of his time in Stuart's room. I suspect that quite a bit of the artwork and hair punching on that first version was done by Graham Freeborn to Stuart's specifications because Graham and I did that work on later models, but it's possible that Stuart artworked the first one alone." "The most critical part of the puppet to assemble was the eye mechanism. The upper part of the skull had to be hollowed out to accommodate it, but the mechanism had to be made in such a way that Frank's hand could pass through it to operate the eyebrows. Early on in the procedure Stuart made a number of prototype mechanisms assisted by Bob Keen. For one reason or another he didn't like them and they were all discarded before they were completed. He wanted something with real subtlety. Something that could be used to express a variety of emotions not just move in a mechanical fashion. I think he was a little too hard on himself. He wanted to make another big stride forward the way he had with 2001. He shut himself away in his workroom for weeks on end and constructed an amazingly decorative brass mechanism. It was the shape of a brain and was operated by a beautiful perspex hand control which Nick Dudman assembled. The mechanism wasextremely complicated with numerous tiny linkages and the pressure on Stuart to get it finished was immense as Yoda's first shooting date loomed. Frank kept coming in for fittings and Stuart progressively looked more and more harassed as he hurried to complete it." Ergo: "It must get intense making prototype stuff on a deadline." Nick: "That's an understatement. As it turned out, that first puppet mechanism was used a lot more on RETURN OF THE JEDI than it was on EMPIRE STRIKES BACK." Ergo: "Then what was used on EMPIRE ?" Nick: "I’ll tell you more about that in the making of Yoda Part II. If you were looking for something totally unique.........found it you have!